The Sheraton sponsored Clann na nGael senior ladies team got their championship campaign underway on Sunday last. In a sun drenched Johnstown the ladies played with a strong breeze in the opening half and were lucky to 4 points up at the break. The visitors controlled the opening 15 minutes of the second half. 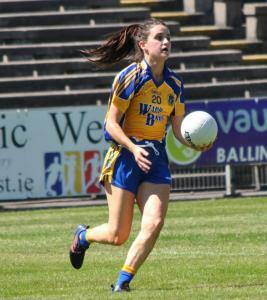 However the Clann ladies really dug deep and ran out comfortable victors. The score doesn't to justice to a well prepared Shannon Gaels team but the Clann ladies were clinical and their work rate was unequalled. Every player in blue played their part. Team: Eadaoin Lennon, Amy Quinn, Kelly Colgan, Leanne Ward, Megan Kelly.,Gillian Wall, Aine Connaughton, Shauna Connell, Ruth Finlass, Caoimhe Lennon, Kayleigh Dunning, Ciara Galvin, Therese Lennon, Sinead Farrell & Ciava Dunning. Subs: Kara Earle, Rosie Lennon, Danielle Greasly, Shauna Naughton & Sinead Connaughton. in a well contested away game. This left Clann facing a semi-final against our near neighbours St.Brigids in Kiltoom. match. Both sides had opportunities to win in normal time but the sides finished level at the end meaning extra time was required. displayed immense courage, spirit, teamwork and skill. With little turnaround (5 days) our Girls faced a very strong Oran team in the county final, again in Kiltoom. half and pushed a fine Oran side all the way, eventually losing by 12 scores to 8. Injuries to certain key players worked against the group but the club should be immensely proud of the entire panel for the tremendous showing from our Girls in the final. Overall the Clann U12 Girls had a brilliant year and continuously improved in all facets of their play in the many matches encountered throughout the county. Well done Girls. Well done to Roscommon Minor Girls who beat Antrim in the All Ireland Minor B Final on Saturday last. Roscommon now face Kildare in the All Ireland Minor B Final. Clann are well represented on the team by Kara Earle, Emma Kildea, Kelley Colgan, Megan Kelly and is managed by our very own Ladies chairperson, Ollie Colgan.